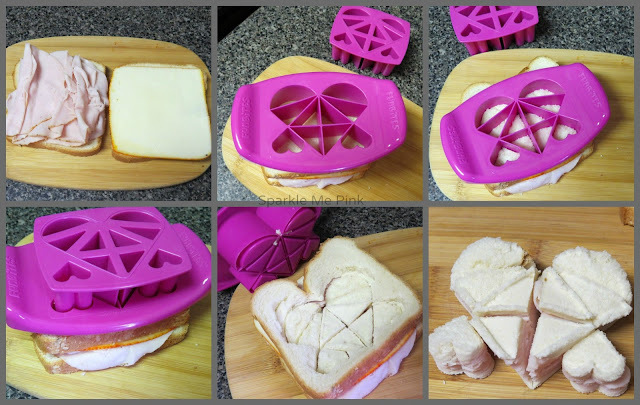 Sturdy and simple to use the sandwich designing tool has quickly become a major hit with my munchkins. Not only were the triangular shapes that make up the bigger picture (the heart) cool to rearrange and put back together, the kiddos also found it neat to actually see the different layers of their sandwich. Ahh the things that amuse them when they are young :-) ---ok I totally thought that was neat too shhh !! Speaking of which I have to admit it, using it has become a bit addictive. I found myself getting inspired to see what else I could place under the FunBites to punch out the funky shapes ( think pancakes or even a cold cut sandwich with different meats to see the contrast of the different layers). Plus the small hearts on the side that they make are party worthy ! Throw some toothpicks in them and you have a new finger food party snack. Also because they are perfect bite sized pieces my 2 year old found it easier to enjoy her favorite ham and cheese sandwiches without being overwhelmed with the larger square or triangle normal cuts I would do for her. FunBites are pretty easy to clean up too! It is able to go in the dishwasher but I prefer to hand wash mine. The only issue I had with mine ever was the day I made sandwiches with muenster cheese, you know how it is a bit sticker than other cheeses? Well, it got caught up in the very corners of the inner trianlges making it a bit difficult to clean them all the way with just a simple quick wash. However, after a quick soak it came totally clean with no problem. Over all I really do enjoy our FunBites and plan on purchasing the orignial cube shaped one so that we can create even more fun shapes with our foods. I can't wait to try this on melon slices ? or pancakes ? or I dont even know what else ! Endless possibilities. I keep entering to win one of these FunBites; I should just buy one! The hearts are the cutest ever.